Union in C are exactly like the structure in C. Just like structure, the union is a user-defined data type. Syntax to define a union in C is similar to structure. There is only one difference in the structure and union that is the storage of memory. Each member has its own storage location in the structure, while the members of the union shared the same memory location, which size is equal to the largest data member. The syntax of the union is similar to the syntax of structure in C. There is only one difference in the syntax of structure and union is only union keyword is used in place of struct keyword. Union variable can be declared before the ending of union definition. Union variable can be declared anywhere in the program after the union definition based on the union scope. Union members are also accessed as members of the structure using the dot operator(.). As we can see that the value of 'a' does not occur as mention in the program while the value of 'b' is correct in our output. This is because of all the variables share the same memory. Hence, the only member whose value is currently stored will have the memory. Union has pointers just like structures and with the help of arrow operator (->), we can access the members. C program demonstrates the working of pointers to the union. Some programmers do not use the union properly. The main issue of the union is to save memory because the union members share the same memory. The union and structure that do not have the name then they are called anonyms union/structure. The definition is similar to normal union or structure the only difference is defined without name or tag. Because there are no variables and names, we access directly members. This accessibility works only inside the scope where the anonyms union is defined. 1. 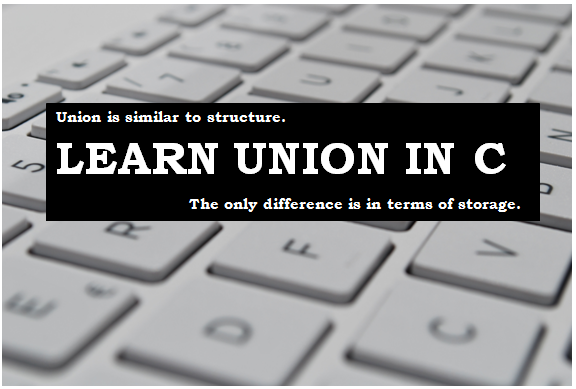 Keyword: The keyword struct is used to define the structure in C and union keyword is to define union in C.
2. 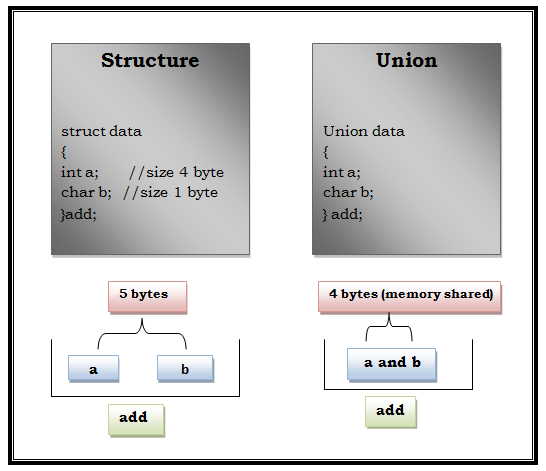 Size: Size of memory is allocated for each member define in structure but in the union, memory is allocated as per the largest member. 3. Memory: In structure, each member has its own space but in the union in C, all member shared the same memory. 4. Altering value: Change in the value of the member will not affect the other members in structure but union in C it affects. 5. Accessing of members: Members of structure can be accessed at the same time but in the union, only one member can be accessed at the same time.